Did you know? 1 in 3 Colorado women are not economically secure. 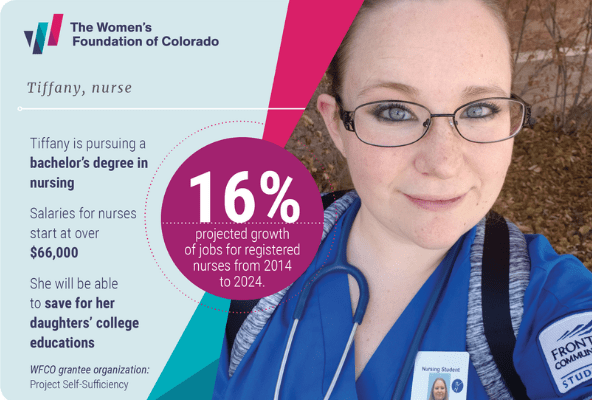 The Women's Foundation of Colorado is working to change that by creating more pathways to economic security for Colorado women. Women are at the heart of our families, communities, and our economy. Yet, only 7.5 percent of foundation funding nationwide invests in women and girls. This is a missed opportunity - not just for women - but for us all. Because when women thrive, we all thrive. Support our essential work and help us change outcomes for Colorado women and their families and build a brighter future for Colorado. For information on making a gift by wire transfer or EFT or a gift of stock or if you are interested in a donor-advised fund or a planned gift, please contact Renee Ferrufino, vice president of development, at reneef@wfco.org or 303-285-2969. Title: Dr. Mr. Mrs. Ms. Mr. and Mrs.